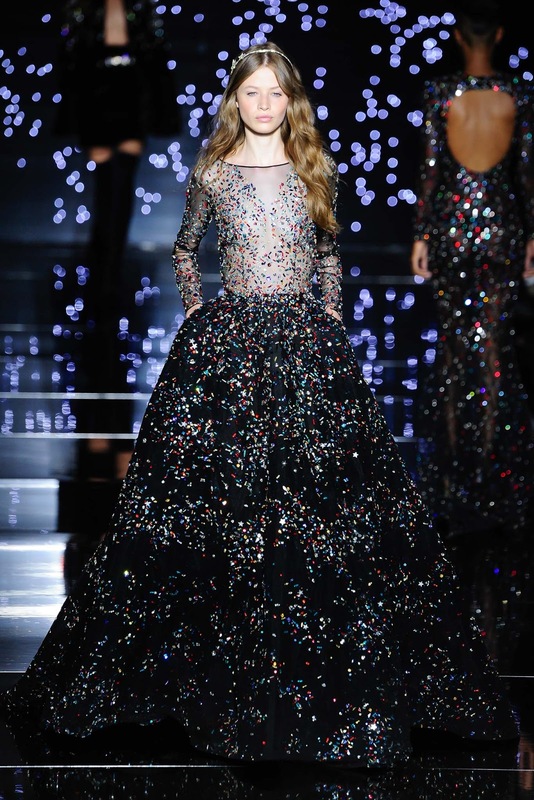 If I could ever attend a Red Carpet event, which is very formal and classy - I would 100% choose a Zuhair Murad design. If you are a fashion lover, you will know doubt know of Murad, but for those who aren't aware of him - he is a Lebanese designer who was born in 1971, and specialises in beautiful, captivating and embellished pieces. He is vast becoming a huge name in fashion. I was so excited to view his Fall Couture collection because literally seeing it, is like being in a fairytale. He brings a girl's dream wedding dress to life. It's incredible, and his designs somehow transport you into a world of luxury and beauty. It's so pleasing to the eye and is actually amazing how much time and effort can be seen just by looking at the pieces. He's no stranger to dressing superstars like Beyonce, Katy Perry and Taylor Swift - so if its good enough for these gorgeous ladies, it's certainly more than good enough for me! Usually when I think of Zuhair Murad, I picture disney princess gowns, beautiful pastel colours with pretty embellishment and fabrics. I feel that this collection is more heavier and "dark romantic" which I absolutely adore! Perfect for those winter nights. It's somewhat refreshing to be surprised and as the show progressed, more colours were introduced which made it all that more great. Vibrant Reds really made the collection pop and as the show came to an end, the tradition Zuhair Murad feel was seen with cool colours gracing the runway. It is said that he was a Stargazer as a child, so I can certainly see the inspiration behind this couture set. I think it's beautiful and adds passion behind the designs. The galaxy theme really added a modern feel to very traditional, stunning gowns. He explored the galaxy theme with his collection in 1999, and 15 years on, he has resorted back to his routes and that's always good for a designer. This collection was completely formal, and didn't have one piece of daywear within the 48 piece set. With Couture pieces, that tends to be the case. Midnight tulle and jewell tones are beautiful for winter night events to make every girl feel like a princess - perhaps the ideal NYE attire! 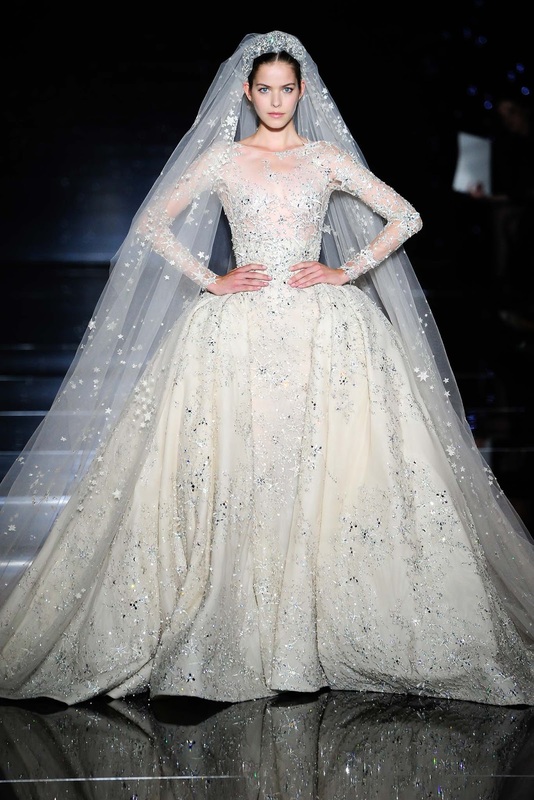 True to Zuhair Murad's Couture tradition, the show closed with a bridal gown. This look usually takes the longest to make and with every collection you can see why. 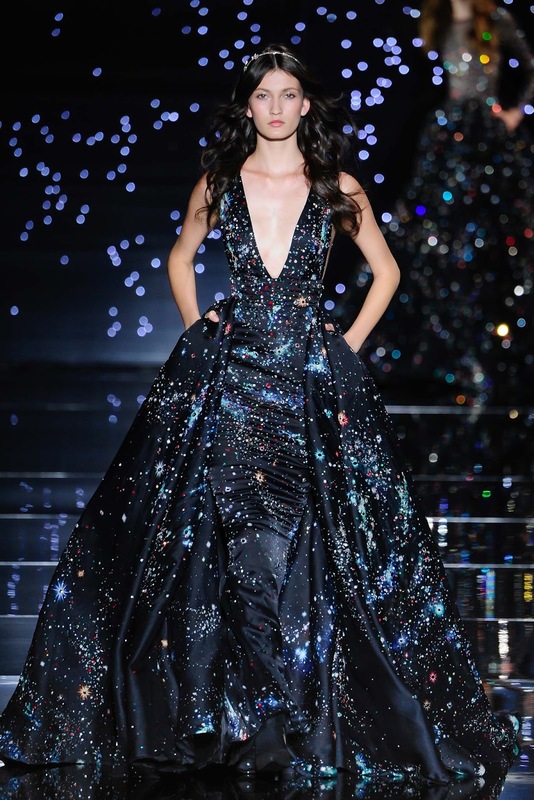 The dress itself plus the train contains a staggering 10,000 crystal stars and sequins of different shapes and sizes to give the dress a lift. It took 20 people to make over a one month period, and wasn't it just worth it! The 44 pound dress "is for the unique bride" said Murad, and adding that he could picture more than one client wearing this monumental piece. Incredible.